The family mission team from First United Methodist Church (FUMC) celebrated the theme of friendship during this summer’s Vacation Bible School and teacher appreciation day. The FUMC team led students, families and teachers in activities that illustrated friendship with one another and friendship with God. 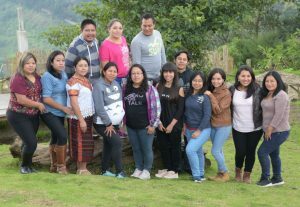 On June 22, the FUMC family mission team celebrated the teachers at Hobbitenango near Antigua. Photo by Andy Leightner. Earlier this spring, Junk and her co-leader, Shelli Pleasant, asked the teachers what they wanted to see in this year’s VBS and workshops. Together, they picked a theme. This, they said, is a dramatic difference from a few years ago when the mission teams and teachers did not have strong communication. In 2014, Escuela Integrada was in poor financial, emotional and spiritual health. There was a real chance of the school shutting down entirely, and the turmoil affected the teachers. 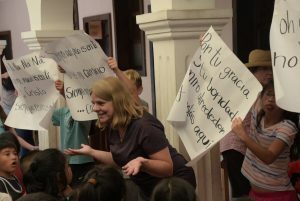 After the school leadership changed from a missionary couple to GRACES in 2015, the teachers were hesitant to connect with mission teams and supporters. They were afraid of being hurt again. The mission team from FUMC provided small gifts for each of the teachers to celebrate Dia del Maestro. Photo by Andy Leightner. FUMC supported the school through the transition and worked to repair trust with the teachers over the next several years. Now, Junk said, there is a strong bond between the teachers and the mission teams. They rely on each other for prayer and support, and stay in touch via Facebook throughout the year. They also co-plan the time they share during the Vacation Bible School week. 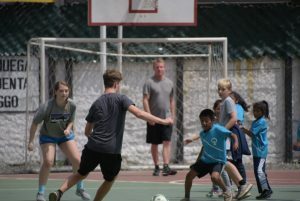 Families from FUMC played soccer with the students from Escuela Integrada. Photo by Andy Leightner. This year, the FUMC team included five families. They sang worship songs in Spanish, acted out Bible stories and helped the children with crafts. Each afternoon, the FUMC team led teacher workshops on ways to use the Bible Blast curriculum and VBS lessons throughout the school day. To conclude the week, the FUMC team celebrated Dia del Maestro—a Guatemalan holiday to recognize the hard work of teachers—with lunch and small gifts at Hobbitenango near Antigua. The team shared their appreciation for the efforts of the school, and the school leaders extended their thanks to the mission team for their support over the years. Shelli Pleasant leads students from Escuela Integrada in worship songs during Vacation Bible School. Photo by Andy Leightner. Pleasant prayed for the teachers for many years before she ever met them. She wants to continue supporting them in how they teach the Bible Blast curriculum and how they integrate the Bible into all areas of the school day. 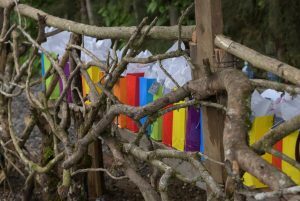 She enjoys seeing the teachers use the music CDs in their classroom, and hopes this year’s theme of friendship connects with them on a deep level. Discover how you can support Escuela Integrada as a Friendship Sponsor by visiting our website, WeAreGraces.org.